Well folks, we had a big weekend for the Eagle Eye Shootout tournament. 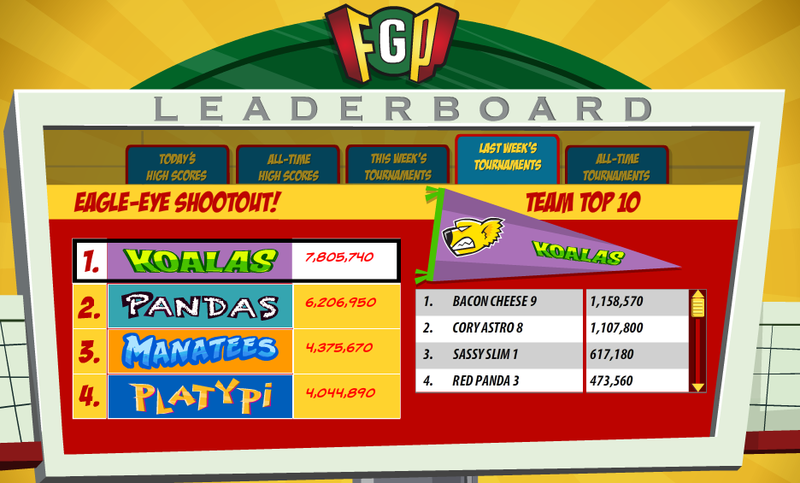 When the dust settled, the Koalas stood tall as the victors after an amazing late-tourney performance by Bacon Cheese 9 – who racked up over 1 million points alongside Cory Astro 8. The Pandas remained strong but without a second all-star to back up Jaws Diehard 1, they eventually fell short. However, every week is a new tournament and all teams are back in the thick of it! Turf Monsters! has started, pitting players in a battle of points in Rocket Foot Rampage, found in SoSo Stadium. Time for the Platypi and Manatees to regain some pride! Posted by fungoplay on July 11, 2011 in Tournaments!! !.